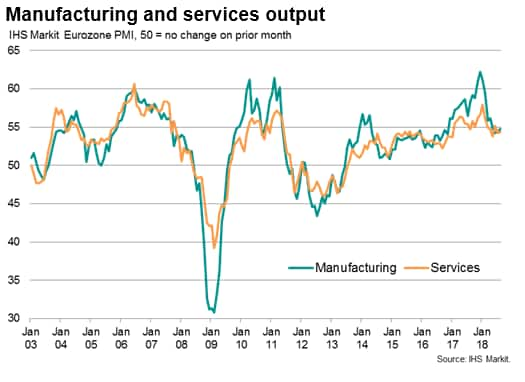 The Eurozone PMI shows the recent run of robust growth of business activity, new orders and employment extending into August. 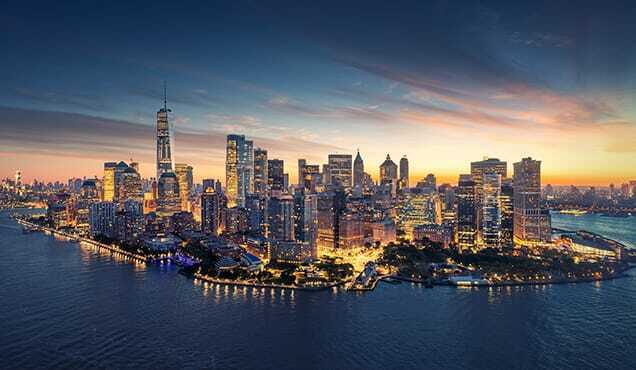 However, the expansion is looking increasingly uneven and the business mood has become more unsettled during the summer. 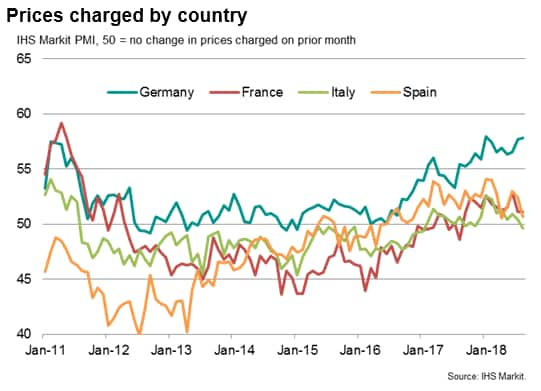 Price pressures are also varied across the region, ranging from near-record inflation in Germany to falling prices in Italy. 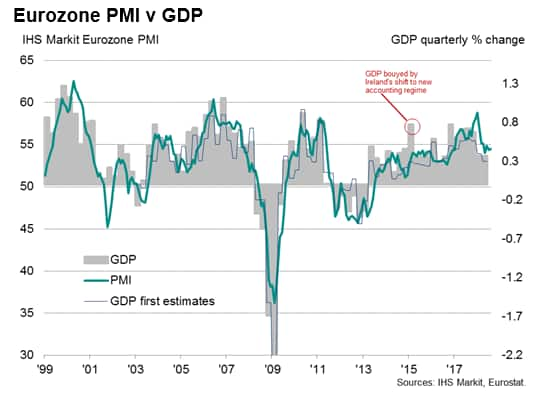 At 54.5, the final IHS Markit Eurozone Composite PMI® came in slightly higher than the flash estimate of 54.4 and up from 54.3 in July. The increase puts the third quarter average so far in line with GDP improving to 0.4-0.5%*. Service sector and manufacturing growth both picked up, although are running slightly below their second quarter averages. Employment growth accelerated to a six-month high, running close to survey record levels. Firms increased capacity in line with firmer order book gains, which pushed backlogs of work higher. However, separate data from the surveys raise worries that the upturn could lose momentum. 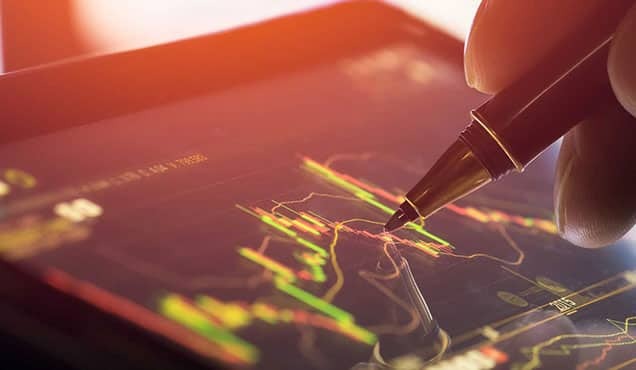 Business expectations about activity levels in the 12 months ahead dropped to the lowest for almost two years, reflecting growing concerns about the impact of trade wars, rising prices and heightened political uncertainty. Sentiment in the manufacturing sector slipped to the second-lowest in nearly three years, accompanied by a slide in optimism in services to the joint-lowest in almost two years. Growth also looks worryingly unbalanced. 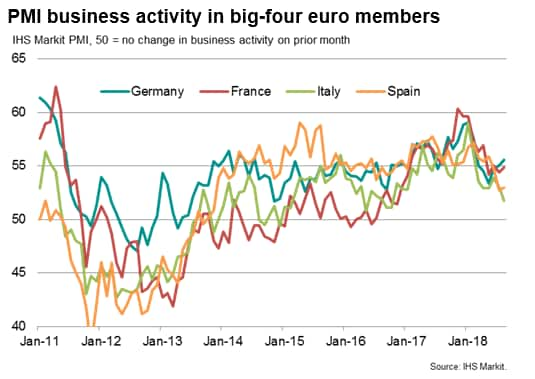 Although all of the largest euro countries have seen a slowdown so far this year, solid expansion is still being signalled for Germany during the third quarter and, to a lesser extent, France. But Italy saw growth slow sharply in August to suggest the region's third largest economy is on course for its weakest expansion for nearly two years. In Spain, the third quarter could be the worst for almost five years, unless a notable pick-up in business activity is seen in September. 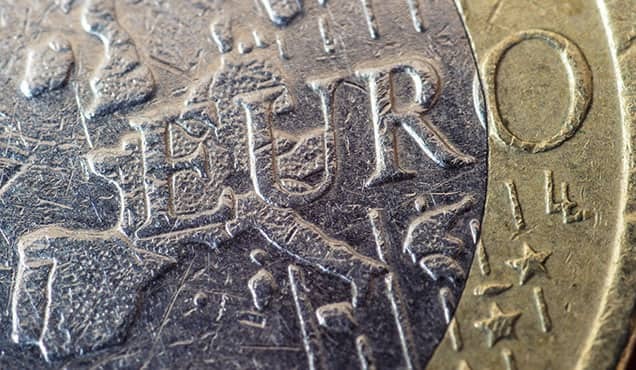 Regression-based models indicate that the PMI data so far for the third quarter are pointing to GDP growth of 0.5% in Germany and 0.3-4% in France, but just 0.1-2% in Italy. In Spain, despite the slowdown, the survey data remain indicative of around 0.4-5% GDP growth in the third quarter. Meanwhile, price pressures remained elevated, though varied considerably across the region. 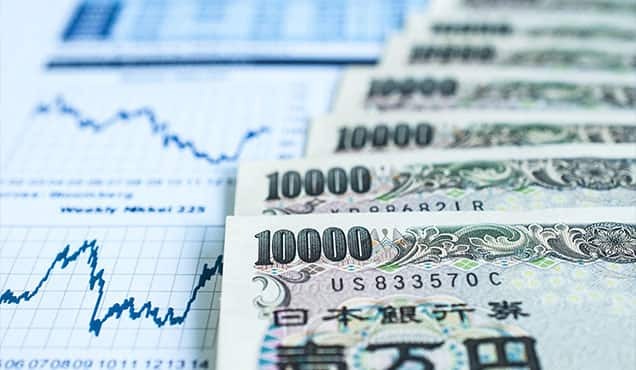 Average input costs continued to rise at a historically strong rate, reflecting higher global commodity prices, notably the feed-though of increased oil prices and upward pressure from tariffs, as well as signs of rising wage pressures in some countries. Average selling prices for goods and services likewise rose at a marked rate as companies passed higher costs on to customers. However, the survey data also show that price trends are very varied by country. 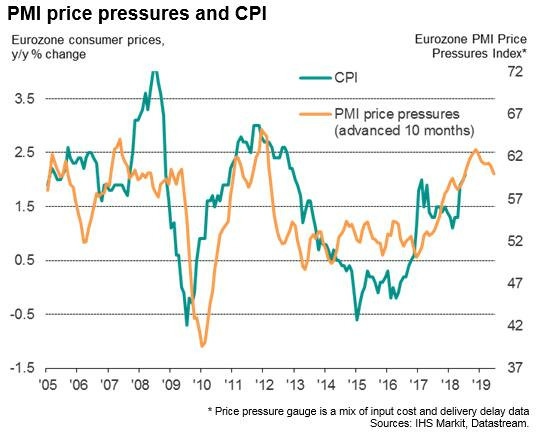 Looking at the four largest euro member states, Germany saw selling price inflation for goods and services accelerate to the second-highest since comparable data were first available in 2002. Elsewhere, price pressures were muted. 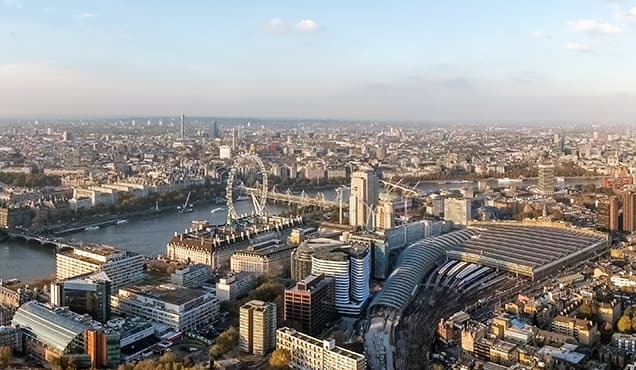 In France, the rise in selling prices was unchanged on July's ten-month low, while the marginal increase seen in Spain was the smallest since April. In Italy, prices fell for the first time in nine months, despite costs rising sharply again. 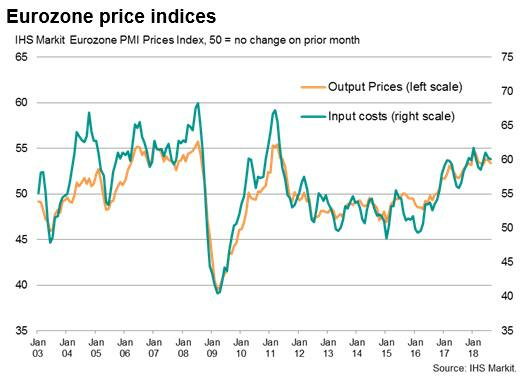 Deflationary pressures, it appears, have not completely disappeared from the euro area. 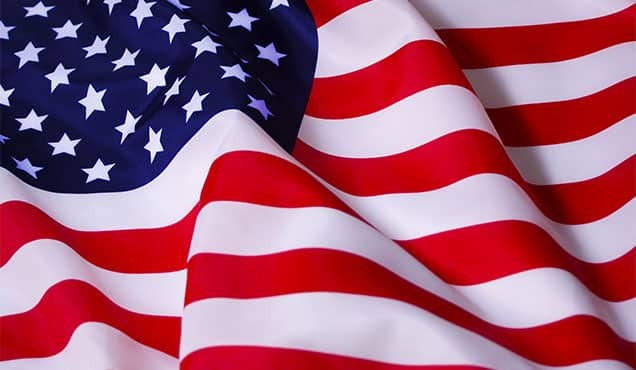 *Note that the prior survey data suggest the first and second quarter GDP growth rates could yet be revised higher from current estimates of 0.4%. Historical comparisons indicate that GDP data tend to get revised higher at times when the PMI indicates robust economic growth.